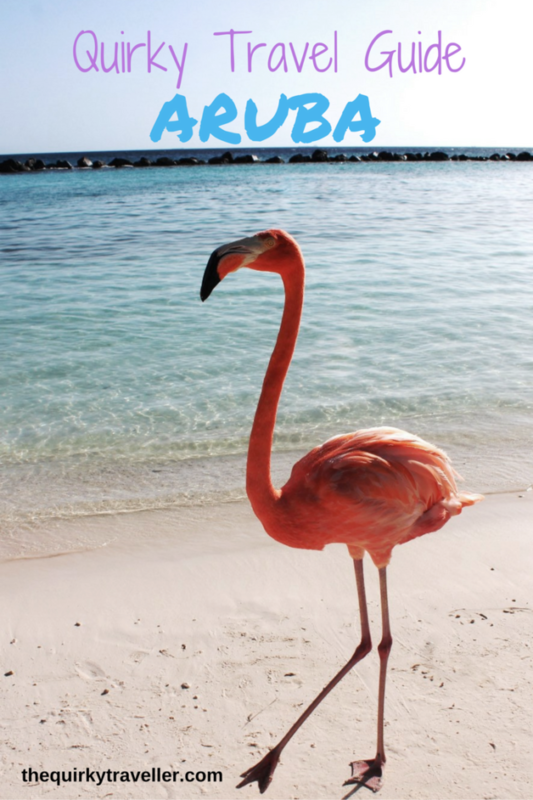 Famous for its white sands and sunshine, Aruba is popular with couples, honeymooners, families and visitors of all ages looking for a relaxing holiday or action-packed break. 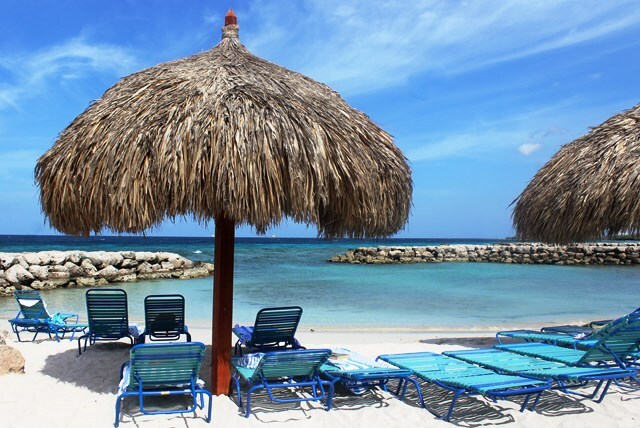 Just off the coast of Venezuela in what was formerly known as the Dutch Antilles, Aruba has more sun than most other Caribbean islands and many visitors return year after year. I spent a relaxing week exploring the island with a group of fellow bloggers, soaking up its friendly, lively atmosphere. Yes, there are lots of gorgeous, sandy beaches on Aruba but there are plenty of activities if you fancy a change from sunbathing. 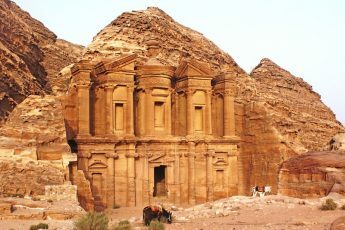 With international resorts, year-round festivals and sport competitions, a wide range of restaurants and bars, many tours and activity centres, an intriguing history, unique natural landscape and a vibrant night-life, there really is something to suit every age and taste. 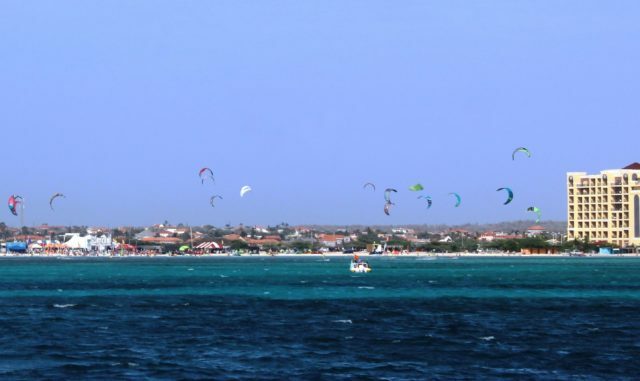 Refreshing breezes blow most days (and sometimes much stronger winds) making Aruba a windsurfer’s delight. The Windsurfing World Championships were being held whilst we were there and it was wonderful to see both windsurfers and kitesurfers whizzing across – and above – the water like enormous seabirds. My fellow travellers had a go at stand-up Paddle Boarding with Dennis Martinez of Aruba Surf and Paddle School and did very well, especially as a rainstorm hit just as they were getting into their stride. (Turns out the island has been suffering a drought and more rain fell in that half hour than in the past 18 months. It was the only rain we saw all week.) 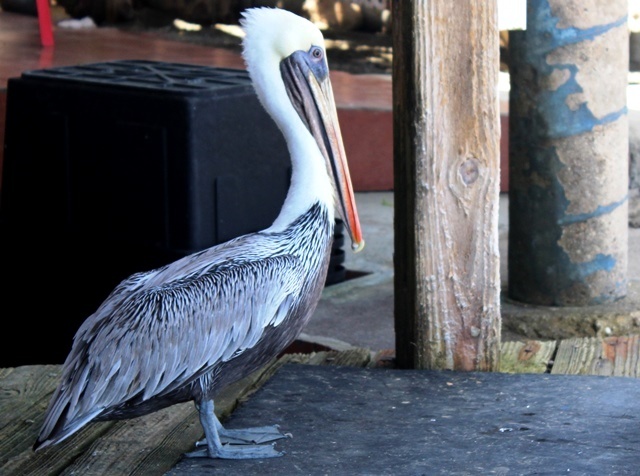 Frigate birds and pelicans add an exotic touch to the scene. 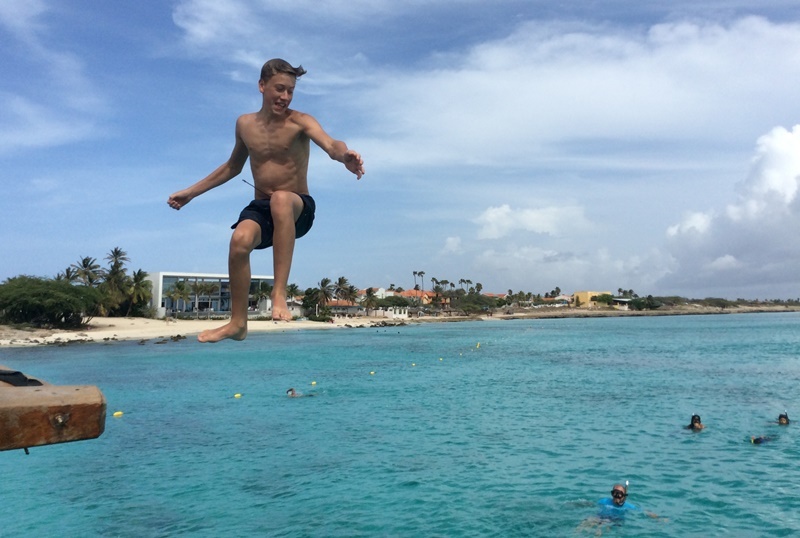 Swimming on Aruba is a joy, as is snorkelling. I’ve never seen so many colourful fish. Irridescent pink and purple, lime green, zingy yellow, scarlet, apricot, sapphire … stripes, spots, splodges … opalescent scales glimmer and flicker in the shadows. Drifting slowly over a coral reef is to enter another world of rainbow silence. I went snorkelling over the wreck of the WWII warship SS Antilla during our Jolly Pirates Boat Trip along the coast of Aruba. You could try SNUBA, an underwater breathing system that combines snorkelling and swimming. There are many Diving Schools with expert tuition for every level from beginner to advanced and other watersports include wakeboarding, kayaking and paragliding. 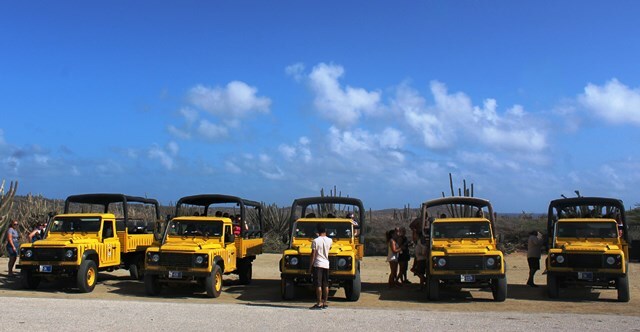 One of the most popular ways to see the island is on a 4×4 Safari Tour. 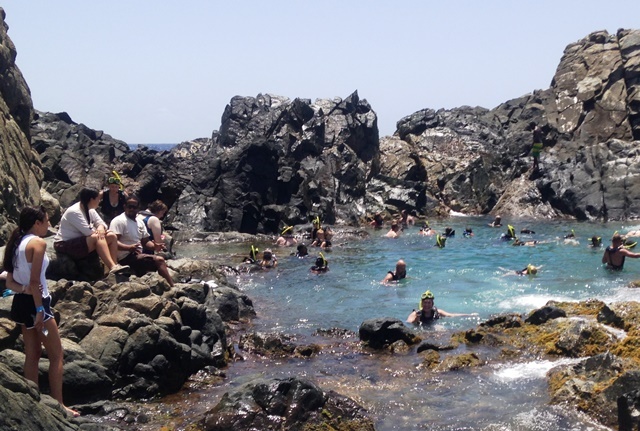 We did the half-day Natural Pool Land-Rover Adventure with De Palm Tours. They pick-up from all the major hotels in downtown Oranjestad up to Palm Beach; check time and place so you don’t miss the start like we did! Travelling in convoy with four other vehicles our tour included California Lighthouse, Alto Vista Chapel, Wariruri Beach, Bushiribana Gold Mill and and the ruins of Natural Bridge, which had been the largest natural bridge in the Caribbean until storms destroyed it in 2005. The final stop is the Natural Pool. After a breath-taking bumpy ride over the rocks and sand dunes of Arikok National Park, we walked down a long flight of steps to a large rock pool on the north coast. It is not quite as idyllic as it may sound as there were many other tours at the same time. You’re given a snorkel and life-jacket and enter the pool in a big group; it’s difficult to enjoy the fish when you’re worried about being being kicked by a nearby swimmer. I’m assured that going early in the morning or later in the afternoon you can avoid the crowds and then it is no doubt lovely. One of the surprises on Aruba is how dry it is. Due to its southerly position, it has much less rain than some other Caribbean islands, meaning it’s a hot, sunny destination all year round. 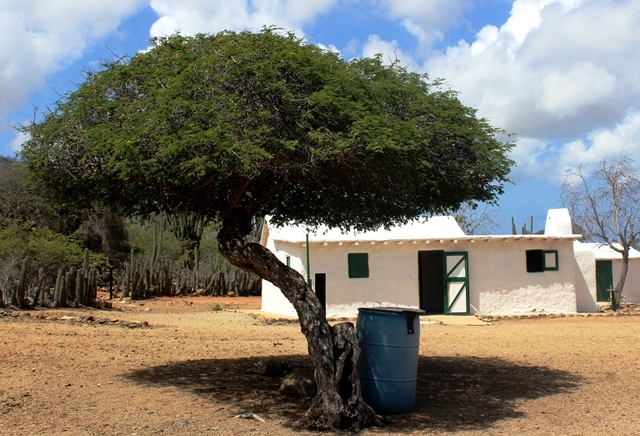 In Arikok National Park, which comprises 20% of the Aruba’s surface area, you can see examples of the island’s geology, flora and fauna. 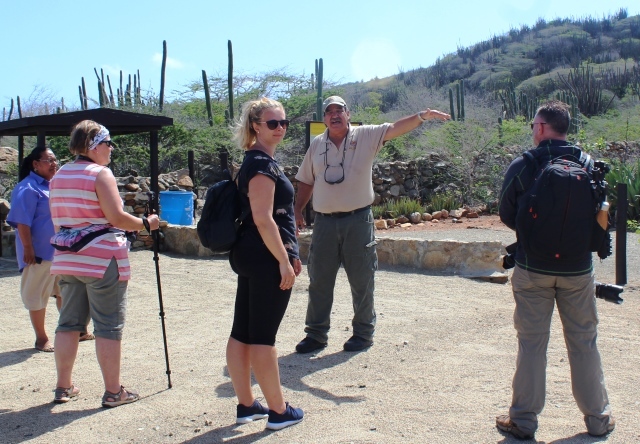 They include rattlesnakes, lizards, iguana, many exotic birds, cactii of all shapes and sizes, the wind-hewn divi-divi tree, aloes and wild flowers. Book a guide to make the most of your time and to learn more about the park. There are also historic sites including 1000 year-old cave paintings by the Caquetio Indians. The island’s oldest cactus (150 years) towers over other spiky monsters and in the restored adobe farmhouse bats flitter across the ceiling. Every Tuesday evening there’s a lively show in the courtyard of Fort Zoutman, the oldest building in Oranjestad. 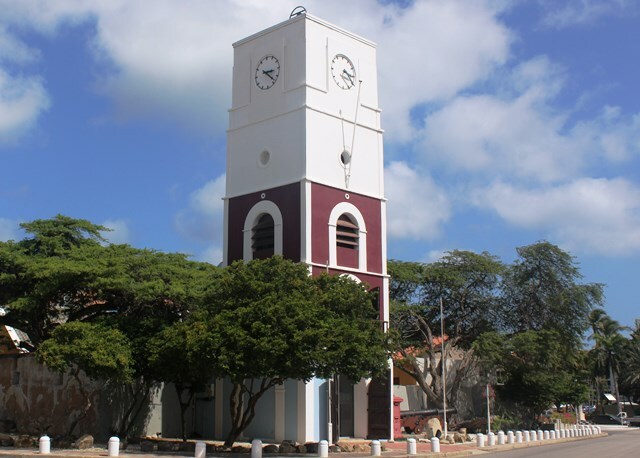 Now home to Aruba’s historical museum, the Fort was built in 1798 by the Dutch and is the oldest building in the capital. A cheery compere introduces local singers and folk dancers, along with marching bands and there’s a wonderfully informal Carnival Parade complete with sparkly costumes and splendidly ornate head-dresses. The audience is mainly tourists but on the evening I was there, the compere shone the spotlight on one of the island’s Ministers, casually dressed, enjoying the show with friends. He looked quite embarrassed to be picked out but smiled and waved to the crowd. Fort Zoutman Museum is well-worth visiting during the day. It has some interesting Aruban art and exhibits covering the early history and development of the island, including the story of weaving and hat-making. 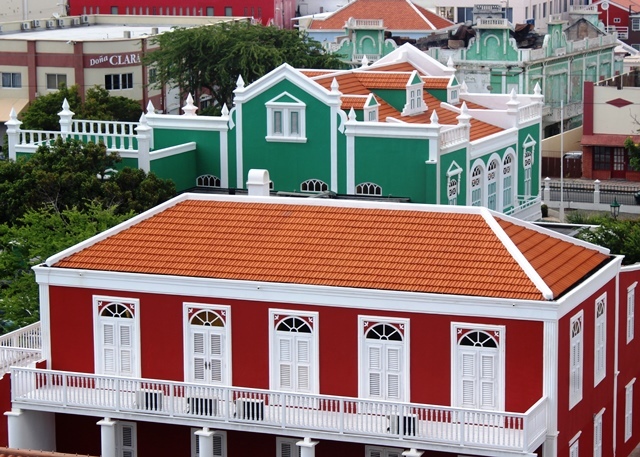 If you ask, it is possible to get up on the roof, where there’s a great view of Oranjestad and its charming Dutch Colonial buildings from the Clock Tower. 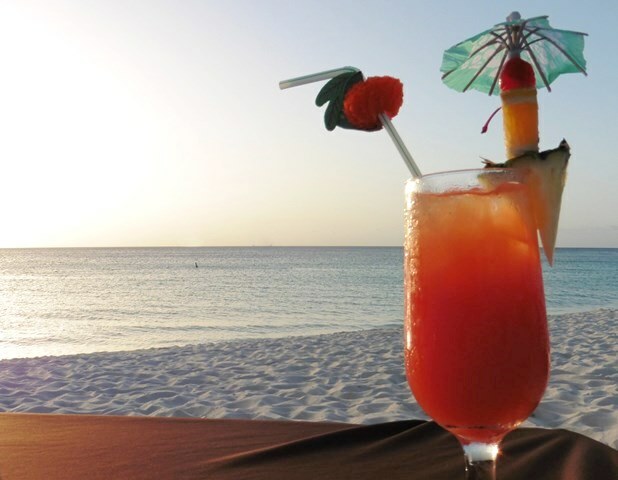 Sitting at a table on the beach, cocktail in hand, silky-soft sand between your toes, watching the sun go down as you wait for your dinner, being serenaded by the resident singer … what’s not to like? This is the dining experience offered by Passions on the Beach, a restaurant on famous Eagle Beach, just one of the many excellent eating-out experiences to be had on Aruba. Whilst we there, we saw a wedding on the beach; perfect place to tie the knot. Another great place to eat is the quirkily named Screaming Eagle Restaurant. As well as indoor and outdoor dining you can be pampered with a ‘Dinner-in-bed’ experience on their very comfortable lounge beds. I had the best food on the island here. Chef Erwin Hüsken serves a superb variety of French-fusion cuisine. The Caribbean Journal voted Screaming Eagle the #1 Restaurant in the Caribbean on their Top 50 list for 2015. Other places I ate at include Moomba Beach Bar on Palm Beach (delicious seafood chowder), Papillon Restaurant in the Village Mall near Palm Beach (salty oysters), Seasalt Grill in the Renaissance Marina Mall, Oranjestad (tasty Caribbean and seafood dishes), Pinchos Grill & Bar on Surfside Beach (super steak and grilled fish) and for breakfast and great pastries, Huchada Bakery in Santa Cruz. 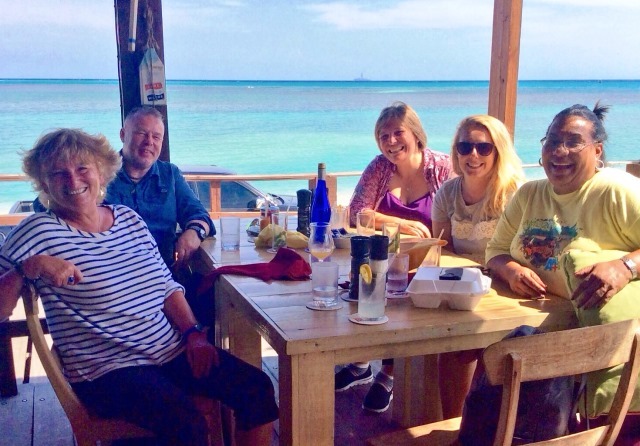 Top of the Caribbean dining experiences for me was lunch at The West Deck on Governor’s Beach. Set on a wooden deck overlooking the sea and airport, it’s very popular with locals and tourists. 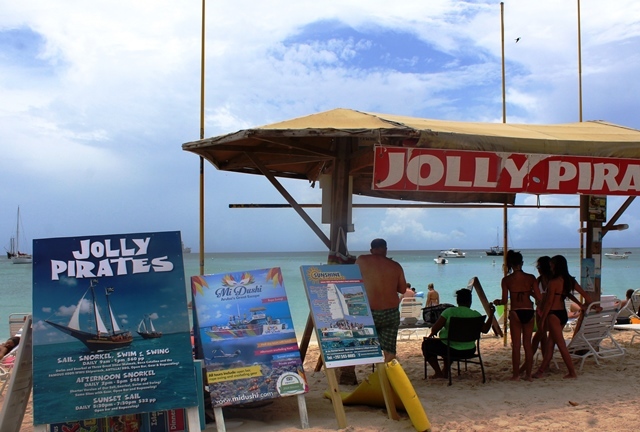 Informal and fun, they serve freshly-caught fish, shrimp, crab and lobster as well as chicken and steak cooked simply with a strong Caribbean influence. I travelled to Aruba with KLM, which flies daily from UK airports via Schiphol Airport. I stayed at the luxurious Renaissance Aruba Resort & Casino, which has a great roof-top pool overlooking Oranjestad Marina. The hotel has excellent amenities but its unique attraction is the Renaissance Aruba Private Island. 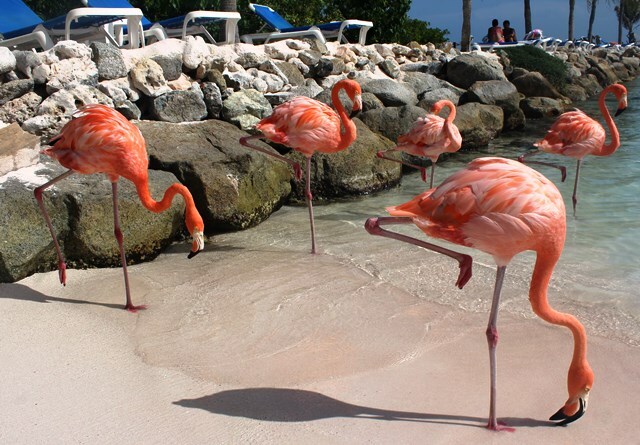 You get there by launch from INSIDE the hotel lobby and it’s home to the island’s only flamingos. It truly is a little piece of Caribbean paradise. 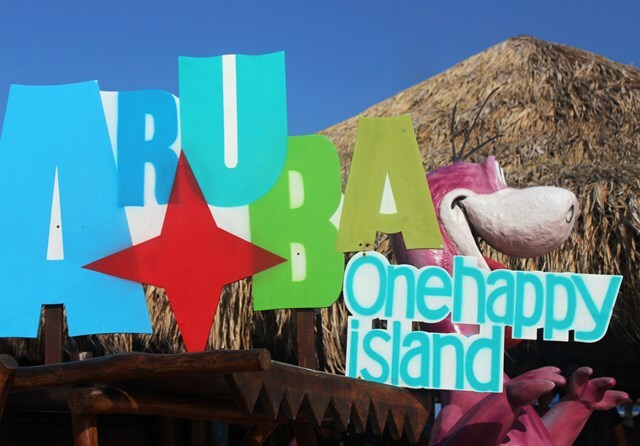 If you’d like to find out more, visit Aruba website and follow their hashtags #discoveraruba and #onehappyisland on Social Media. Special thanks to our host Amayra Boekhoudt, who looked after us on behalf of Aruba Tourism with kindness and good humour all week. I so enjoyed staying on Aruba. Unlike some blog trips we had the chance to really relax and take time to get a real feel of what it’s like to holiday here. If you’re looking for year-round Caribbean sunshine, great beaches and loads to do this really is the place to be! Yes John, I really did love Aruba ???? Those white sandy beaches and the warm Caribbean Sea made a relaxing contrast to the action-packed days. 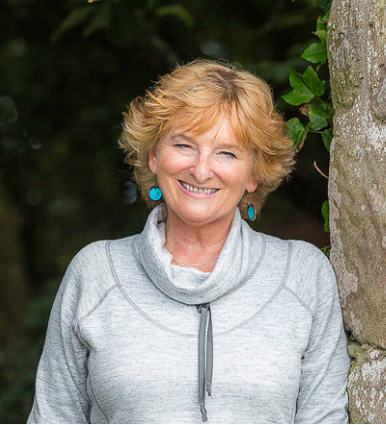 It really is that lovely Carol 🙂 Swimming in that blue sea is just heavenly, the people are friendly, it’s safe and just big enough to have variety without feeling overwhelmed. The biggest plus is the year-round sunshine. This is just the most wonderful island. 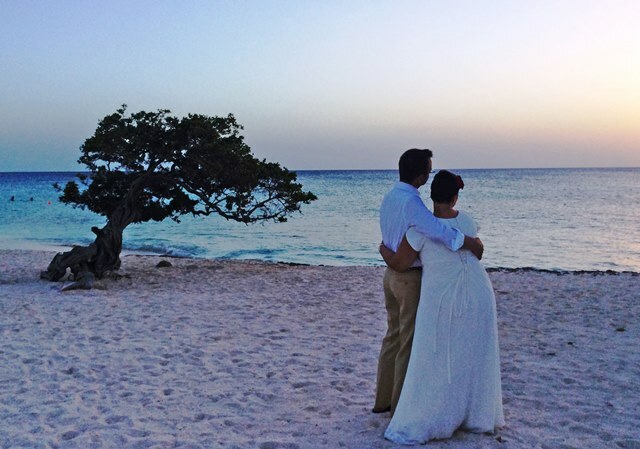 We had a brilliant holiday in Aruba many years ago and it looks like it has just got better. Hopefully there are still some places you can still get peace and quiet on the beach!